Last week I was away from blogging. After a quiet time with family on Labor Day, rest of the week turned into a chaos: teenager's school activities, college search, ACT, scholarships search, a job search for husband, helping our daughter with her college, my own job hunt, interrupted by couple of power outages were less than blog friendly. Each time I started to respond to the comments, I would be interrupted by some emergency. After it happened third time on the row, I decided it was a sign to take a break and take care of all things required my attention. We were able to sort things out and make plans, and now I can get back to blogging and share some recipes. You could use some comfort food. Sounds like you have had "one" of those weeks. Hope it's smooth sailing and quiet in your home for some time to come! The pasta looks wonderful! That biscotti looks so good!!! And this week I have been craving pasta badly! Great post. 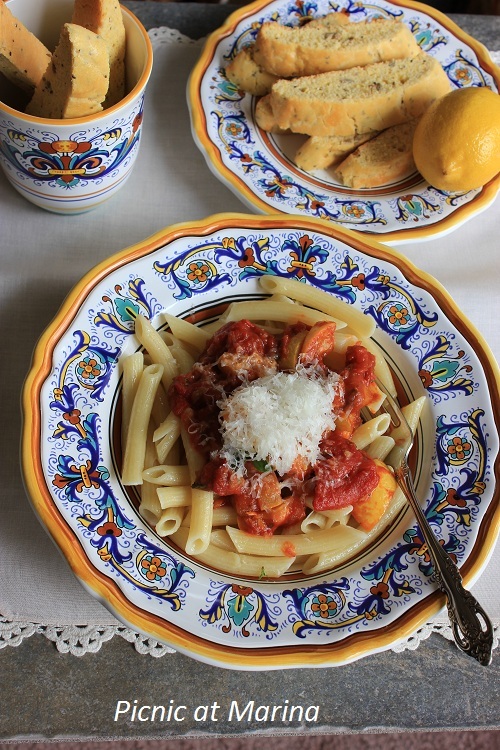 Sounds like a hectic week and what could be more comforting than a bowl of pasta. Pasta is seriously the best, a week of pasta is one commitment I could get behind! With all that's going on you still found time and energy to make homemade fettuccine and homemade pesto????? Please send me some of that time and energy. One of my daughters new school friends has an Italian nonna who has introduced my daughter to biscotti and she loves it so I super keen to know how to make it, looking forward to your recipe. It sounds like you were being told to step away from the computer for awhile! I like your china. It sounds like it indeed. Thanks for the compliment on the china, it's Italian. Deruta... :) Love it! Pasta is definitely a comfort bowl of love to me!! These look so fabulous, love your dishes! I'm excited to see your biscotti recipe, I don't go a day without my biscotti! Perfect dishes for a crazy week! Can't wait to read about the biscotti. what a wonderful looking pastas!! I'll definitely be back for the biscotti! Please do come back, I would love to know what you think. Have you changed your blog to wordpress? Yes, I am still getting to know wordpress as it is different to blogger (still improving the site too). In time I will see which one of the two I prefer. I have set up networkedblogs, blogloving and RSS posts to follow me. I will link it to facebook too. Hope I won't lose you! It takes time to make friendships with fellow bloggers and you get kind of attached and look forward to each other's posts. I will certanly keep following you! Marina, those look delicious! And I've got plenty of basil in my herb garden. I make biscotti a lot - don't think I've blogged it yet, though. 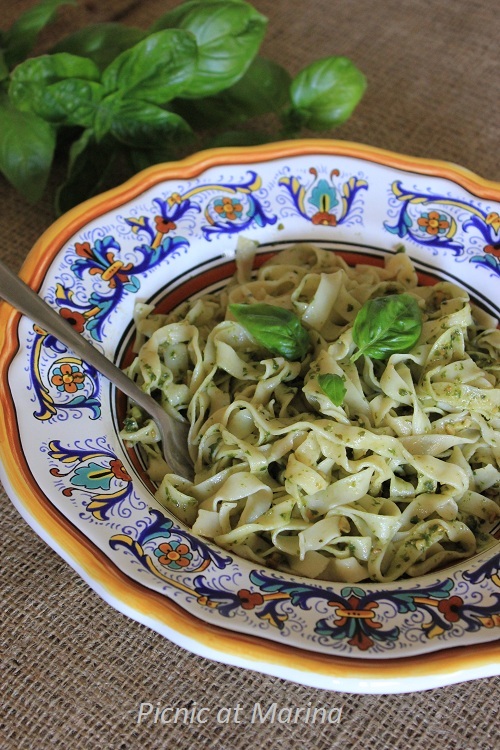 A good dessert for the pesto pasta! Didn't grow any yellow squash this year, but I can pick some up at the farmers market. Hope you have a less hectic week next week! Hi Jean, herbs are all I have so far in my garden! Heat killed almost all vegetables, despite extensive watering... :) I would like to see your biscotti recipe. A very busy week and a very delicious plate of pasta! This looks just delicious, my friend. Thank you for sharing! Glad you were able to take care of all your problems Marina - we all need a bit of time occasionally to sort things out in life! Looking forward to seeing the biscotti! Hi Charles, glad to see you here: I've been missing you! :) Hope things are going well and we'll see you soon on your blog with something tasty or with a book review. Don't you just love those inconvenient power outages? Oh dear, those power outages sound very inconvenient! I hope they fix whatever the problem is Marina! :D The pasta looks delicious! mmmm looks so good and beautiful plates!! I love these pasta dishes Marina, they look so fok worhty. Glad to here things are getting back to normal. Have a lovely weekend. Oh these things happen don't they! I know I'm easily distracted when I've decided to do something! Looking forward to the biscotti! Thank you, Mary, for your kind words... :) Have a great weekend! Thank you! :) Are you still on the diet? Your pasta looks incredible my friend! And I understand how it would be hard to constantly blog under your conditions! Marina, Both of your pasta dishes look amazing...I can relate to you on the busy week, although I sure don't have teenagers in my home any longer; all grown...married, with young children of their own, but either way, I do get involved in the little ones' busy school activities. Various, and endless pasta dishes are always a welcome in our family, and everyone loves pasta! Great looking dishes (both the pasta dishes and the actual dishes holding them!). Sometimes real life makes blogging difficult, alas. But no worries - we'll always be back to read your great posts and learn new recipes. Losing power stinks. When I lived in Florida that happened too frequently, so I learned and got a battery backup for my computer - it gives you enough time to save whatever you're doing and shut down.